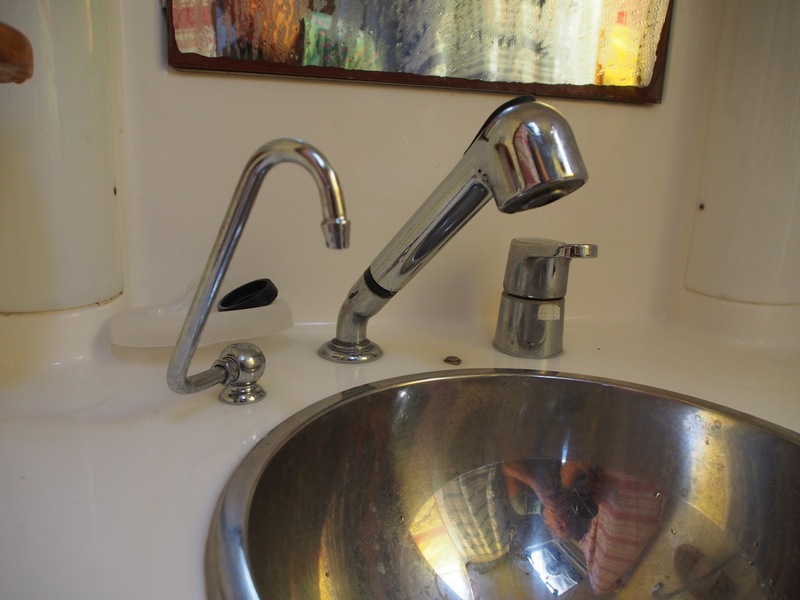 Having sufficient potable water on board for long passages or in parts of the world where water is scarce and expensive or simply not safe to drink has long taxed cruising yachties. 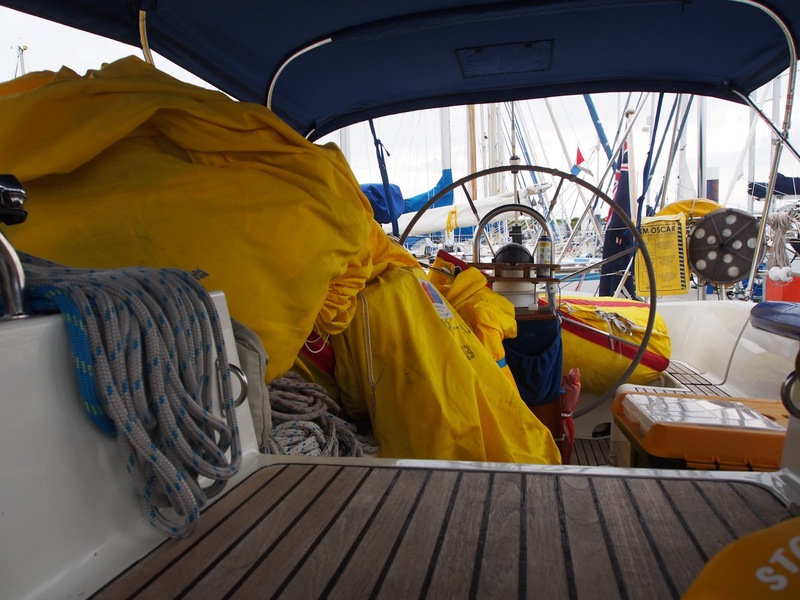 With space under the master bunk, conveniently atop Temptress’ largest water tank (250 litres) and a good charging system in place her crew have long planned to install a reverse osmosis water maker. The water maker works by using pressure over a semi-permeable membrane through which only pure water molecules can pass to force the water through leaving behind the salt and other molecules. However before the sea can even reach the membrane it to go through a system of filters so maintenance is essential to the health of the system and requires a powerful pump to force the water through it. 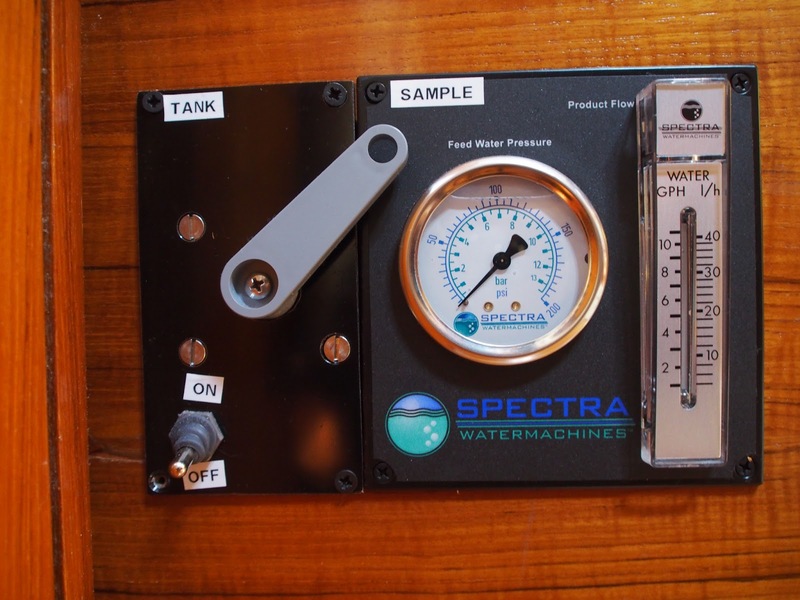 After a false start when our chosen plant was discontinued just before we placed an order, a Spectra Water Maker was purchased, versions of this one are used in Trans-Atlantic rowing boats and in a wonderful happen-chance the recommended local installation company belongs to a long time friend Scott of 1 Degree West Marine who has overseen much of Temptress’ engine maintenance over the years. 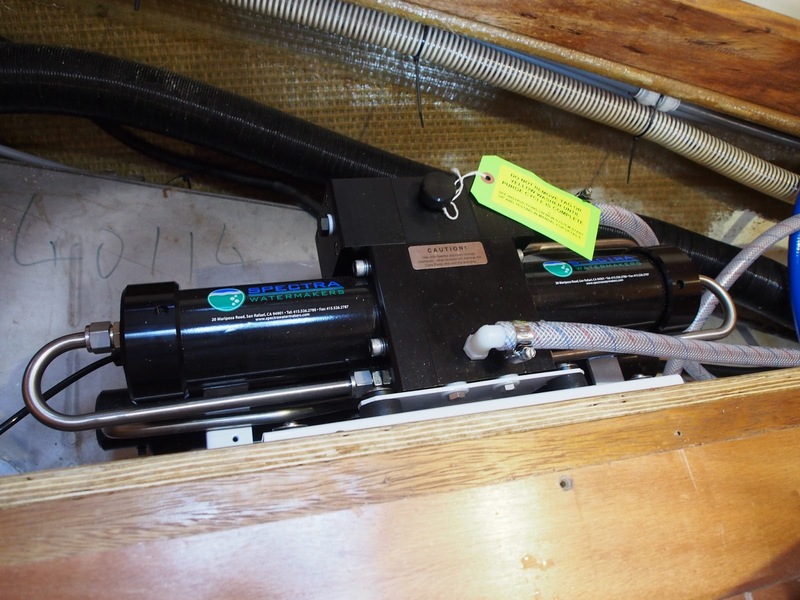 After much discussion the under the bunk installation went ahead despite having to lift the bunk up some 50mm to fit the larger Spectra pumps and filters. Hatches in the bunk base enable access, a lift out just before the Bank Holiday saw the fitting of a seacock for the water inlet and a valve fitted on the water pipe from the deck filler. The latter enables us to isolate the forward tank meaning that the watermaker supply is separate from the other two tanks under the saloon floor so if we are filling up from a dubious shore based supply we have the comfort of potable watermaker water in the forward one and vice versa – should the watermaker fail and fill the forward tank with saline water the other two should be unaffected. Then last Wednesday just prior to high water as Temptress is situated right by the marina entrance in the flow of the new tide the water maker was commissioned. The pump was run for 20 minutes to bring the whole kit up to pressure and check for leaks. There were a few problems with leaks, having the hot water plumbed into the flushing system and our recently fitted domestic water pump was found not to be high enough pressure to do the flushing/rinsing of the filters, a process that uses fresh water. 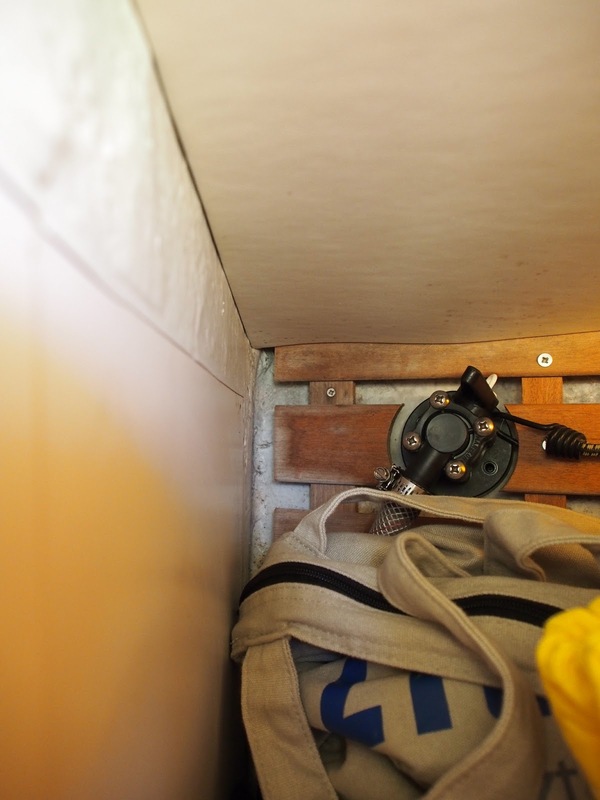 Upping this pump’s pressure was simple enough thanks to a call to the manufacturers but the recently replaced safety valve on the calorifier had to be swapped for one of higher PSI… resulting in most of the water we had on board being released into the bilge whilst it was changed! 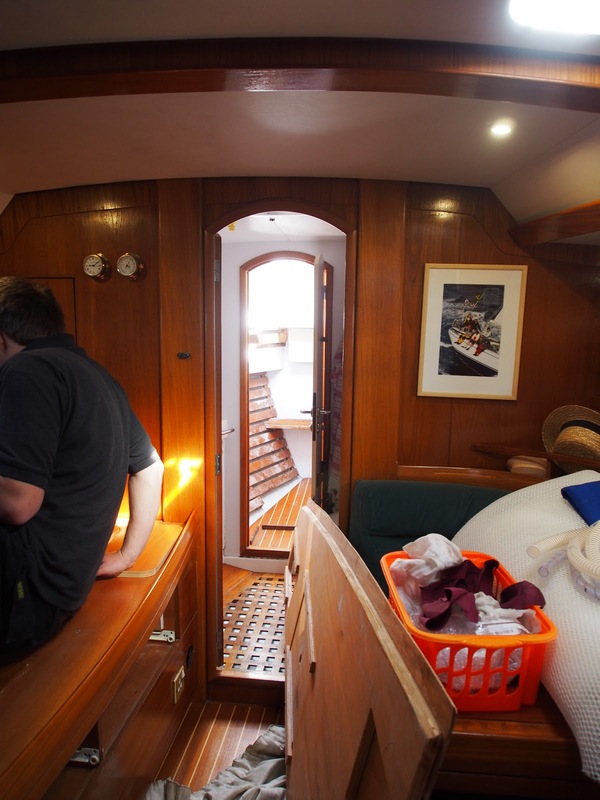 What all this fails to convey is the chaos of the past couple of weeks – each day our bed had to be stripped, right down to removing the mattress and its wooden base plus the three drawers that sit under the long edge of the bunk. 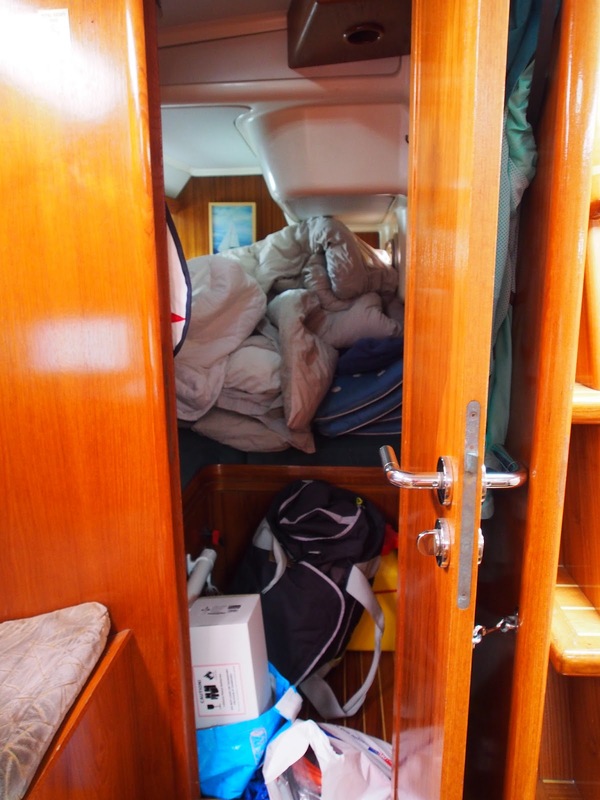 All of that had to be stored elsewhere – piled up in an aft cabin, on the saloon table and in doorways aft. When Nathan and Scott left for home at the end of their working day we’d remake the bed so it could be slept in. And, on days when they weren’t plumbing in the water maker, another of Scott’s employees was overhauling the engine which is located under a sofa in the middle of the saloon. 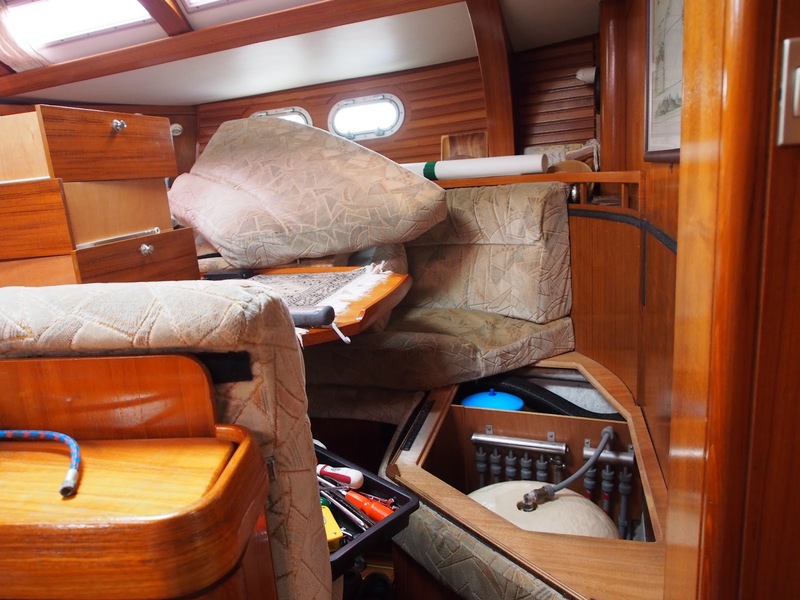 Then saloon cushions and the table were upended in a huge pile on the port hand sofa and toolboxes, rags and a prone engineer filled the galley floor on the starboard side. It’s a bit like a hurricane has turned everything upside down so that even boiling a kettle for a cuppa becomes a major challenge working around and over the obstacle course. There’s a man in our bunk!